Ask Anthony: Get a Master’s Degree in Civil Engineering or an MBA? A few months ago, I wrote about this topic in more general terms regarding credentials to focus on as a civil engineer. However, the specific question of whether to get a master’s degree in civil engineering or an MBA continues to arrive in my email inbox. The answer depends on a few key items. What does your discipline require for you to advance? In the current environment, every discipline of civil engineering has its own guidelines, requirements, and trends. In many areas, a master’s degree in civil engineering is extremely important to your professional development, where in some areas employers may not require it. You need to figure out which is true for your discipline. Let’s take structural engineering as an example. From my experience in working with and coaching structural engineers, a technical master’s degree is held in very high regard by companies in the industry, and when hiring, they look for it. On the flip side, in my field of civil/site development, I would say a master’s degree in civil engineering might not be as important to land that job. Why? Because site/civil is a general field that encompasses many different kinds of civil engineering, and many employers feel you can learn what you need through your project work and specialized training. As civil engineering continues to become increasingly complex, how education is balanced with experience may see a change. What path do you want to take in your civil engineering career? There is a very blatant fork in the career road that most civil engineers inevitably arrive at. Do you want to remain highly technical in your career and work mostly on technical aspects of projects OR do you want to move into management? If moving into management is something you desire AND a technical master’s degree is not critical to advancement in your specific field of engineering than a master’s in business administration (MBA) may be a good option for you for multiple reasons. One, an MBA will give you the business and finance knowledge that you most likely didn’t learn in engineering school or on the job. Secondly, an engineering degree plus an MBA is a combination that gives you a tremendous amount of flexibility in your career, regardless of what kind of field you go into. There are many very prominent CEOs across the world that possess this dynamic degree combination. What benefits will each degree give you now and later? Lastly, consider in detail the benefits that each degree would offer you, especially versus the cost. Some engineering companies might reimburse your education only if it is an engineering degree, not an MBA. Some companies might offer a bonus or promotion for obtaining a certain type of degree. Some companies might require a certain degree for partnership in their firm. This list of benefits will most likely be different for each person, but it is important that, like any good civil engineer, you analyze the consequences in your decision. Now, there are some pretty interesting alternatives to an MBA for engineers, namely the master’s of engineering management. There are several different programs like this, maybe even with different names. They are meant to be a business degree, but more specifically to the business of engineering. If you are confident that you plan to be a manager in the engineering world long term, these alternative programs might be the best option for you. Anthony Fasano, P.E., M.ASCE, is the author of Engineer Your Own Success, co-host of The Civil Engineering Podcast and co-founder of The Seller-Doer Academy for Civil Engineers. 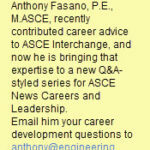 Email him your career questions to anthony@engineeringcareercoach.com. 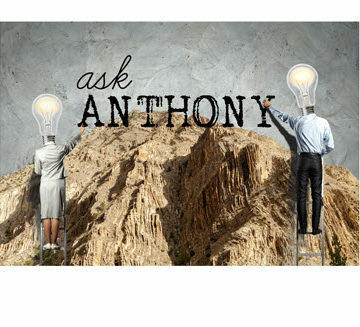 Ask Anthony: Will a Master’s Degree Move My Resume to the Top of the Pile During the Job Hunt? Ask Anthony: How Many Hours a Week Does It Take to Get Ahead? 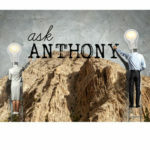 Ask Anthony: Should I Plan to Work for the Same Company My Entire Career? This is my experience as I have both. Employers will not pay more for an MS or an MBA. Independent to what studies say, in consulting you will not get paid more for either degree. What matters is the PE title. Now, an MBA could open the door to a career in finance which is more lucrative than a career in engineering with less drama. Awesome feedback here, thank you! Masters degree will be more useful. i am a civil engineer, who graduated a year a go , am pretty confused between MBA and Construction managment . which MBA program exactly to you recommend , and what kind of postions and jobs i may be in with each one (either with an MBA degree that you will advise or Construction management). Please provide me details and examples as much as you can , am in a great need for help. Hi Anthony, thanks for the good thoughts in the article. I am a civil engineer with 7 years experience working in big construction projects. Currently I am interested in an MBA, but having second thoughts as it may be taking me further away than desired. My intention is to gain business/finance knowledge but not to deviate that far away. Any suggestions for a good program as a 1-year break to go back to school? Dear Anthony: I just wanted to ask that I have recently completed my bachelors in engineering (Civil) and now before joining any job I first want to pursue my masters degree in structural engineering since I have always been fascinated by structural engineering but unfortunately only few reputed universities in Australia offer that degree. So, should I go for masters in civil engineering if I want to work as a structural engineer in future? Sabeen I would try hard to get a structural engineering master’s degree or nothing at all. I don’t think civil degree will help much for SE and it’s a lot of time, effort, and money. I earned both a master’s in environmental engineering and after 7 years as s process design engineer, a master’s in international economics, which allowed me to take infrastructure-esque courses that a traditional MBA did not permit, such as project finance, public private partnerships, and micro-economics of infrastructure planning. This was fantastic for me to really understand the concept of “payback” time-value of money, and privatization, but now, as a professional working in asset management, which spans technology, management consulting, and engineering, I’m seeing the true value of an MBA and may still pursue one online to keep costs down. I think these EM masters are more appropriate if you stay in design, but the MBA really only is valuable if you get into the softer side of the business, such as project finance and asset management. This proves that it really is a case by case basis for every person, but you sharing this I am sure will help some engineers make their decision. Thank you. Thanks for the great article.. This is actualy a dilemma for me.. I’m a structural engineer with 5 years of experience but I can see myself in management filed in the future.. So do you think a masters in structural engineering or MBA Is better for me? If you already with a good firm, I would consider the MBA. A lot of SE’s have trouble getting a job without the Master’s. Dr. Murthy Bondada, P. E.
As per the current trend and work environments, I think that all master degrees in engineering ( civil, mechanical, electrical or others) should include some courses covering business administration relevant to that specialty engineering thus making the master degrees in engineering as hybrid. I read an article some time back claiming auto companies in USA went down when they were headed by business administrators instead by technocrats who came up after working in several divisions in the auto companies. When the product of a company is not competitive, no MBA is able to uplift it. Mix of both disciplines engineering and business administration at master level tailored to specific engineering discipline is ideal.